It was just a few months ago when fix8 took their first round of funding from Vickers Venture Group. The amount taken was then $3M. Vickers Venture Group is a Singapore-based private equity firm. This time the company says it has landed SK Telecom, which is a leading South Korean telecom, taking some $3M more to make it $5M in total funding. Fix8’s first part of the funding took place last year in October. Fix8 is a web cam avatar community that lets you create animated avatars with your web cam by reading your expressions and gestures. When we took a look into their web site we have discovered tons of tools that you can play around with, including fix8’s wide selection of pre-made avatars and other accessories like voice manipulation, graphics and editing tools. Those clips can easily be embedded in your website or social networking profile, or use it for your instant messaging client like AOL, MSN, Skype or Yahoo Messenger. 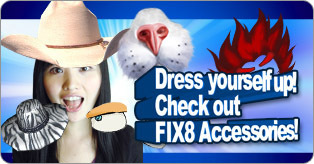 Fix8 has recently teamed up with a couple of other companies like Pringo and Stickam. fix8 has also expanded its signature technology through a key partnership with Shanghai Media Group (SMG) offering Auditions(TV) to create a new world of Interactive TV where audiences can submit fix8 content for insertion into LIVE or taped programming. fix8 will further bridge the gap between communication devices with the launch of fix8 MOBILE. While we kept on researching around for more information we came across the following user review on the service. Gave it a try for fun. The idea is great but they have a way to go. It does not work if you have glasses on, and some people’s eyes do not work with them off. I did not play around long enough to have my body in the picture also, but from the image above it seems the avatar sits in front of the user. It needs to be placed around them so that when users turn their heads sideways, you can not see their head, but the side of the avatar’s head. It could not see my mouth moving unless I tilted my head backwards so as to get more light on my face (I have a fluorescent light above me so my room aint dark). Fix8 is based in Sherman Oaks, CA and is a division of Mobinex, Inc.
Fix8 is a unique interactive communication application that allows people to customize their on-screen virtual appearance in real-time using avatar technology and creative accessories. Fix8 integrates human expression analysis and rendering capabilities, avatar/facial sculpting and animation technology, voice manipulation, and one click 3D face maker design capabilities in one package. Fix8 can create live streaming enhanced video to integrate into IM or other broadcast (such as TV) experiences, or record still images and fully-rendered videos. While certain elements of the Fix8 product line can be found in the competitive landscape, the core technology to provide real-time animation in a consumer oriented application is unduplicated. Further, the specific feature set(s) offered in the Fix8 product line is unique and disruptive. Fix8 differentiates itself from the competitive set by offering a unique easy to use application that incorporates avatar technology, 2D/3D facial accessories and flash animated accessories, voice masking and altering, and the ability to for a user to create their own individual set of avatars through use of photorealistic images all married with Fix8’s own IP that analyzes and renders human expressions so that the rich animated creations match the movements of the user in real-time for use in video and streaming. Fix8 has coined the term user-generated reality to define the broad spectrum of creative self-expressive user-generated animation in real-time. Fix8 enhances the entertainment and enriches the communication experience of its clients’ customers by breathing new life into digital channels across multiple mediums. Mr. Linh Tang is a senior executive (but he is really quite young at heart) with a demonstrated record of accomplishment in worldwide business operations. Tang’s vast experience in technology, operations and management make him the ideal fit to lead Fix8 on its mission to revolutionize virtual communication and expression. Tang is responsible for more than just Fix8’s vision and strategy; he is responsible for driving the “Innovation Bus” all the way to the user. A veteran of several startups with 15+ years in IT and consumer goods industries, Tang is – quite simply – THE MAN. Ms. Chuning Ho brings over 17 years experience in application development, project deployment, executive management and business operations to the Fix8 team. As a founding member of the management team from initial start-up to present, Chuning knows where all the bodies are buried. Her main responsibilities include (but are not limited to) resources management, process standardization and communication strategy establishment and implementation. Chuning also manages to keep the entire team in check almost effortlessly. She is Fix8’s own secret weapon. Mr. Scott Freeman brings extensive financial management experience to the Fix8 team. Scott did hard time with Deloitte & Touche, working in their entrepreneurial division, before he made his move to California Suncare, Inc. where he was instrumental in growing the company from $3M in revenue to $45M and assisted in its sale to a private equity firm for approximately $88M. Long story short, Scott knows how to make money and can see a deal well over a mile away. With a wife that is a successful interior designer, a daughter who is an artistic savant and a son who is a terror on the soccer field, Scott doesn’t have to work but he believes in Fix8 and, honestly, someone needs to keep Jake and Dinesh in check. Mr. Dinesh Bhatia brings direct experience in the wireless, television, Internet and software industries to the Fix8 team. Dinesh is a pretty smart guy; he graduated from Washington University with double degrees in Electrical Engineering and Computer Science and a Master’s Degree in Biomedical Engineering from Imperial College, London. Dinesh loves the disruptive creation and generation process of the software development community and is responsible for building strong partnerships to enhance the Fix8 user experience through added competitions and connectivity. In his spare time, he loves fiddling around with computers, gadgets, his saxophone and keyboards, photography, astronomy and spending time with his family. Dinesh also loves long walks on the beach – but this is not a personals ad – so let’s stop here. Mr. Raphael Ko brings extensive experience in software development and information technologies management to the Fix8 team. Directly responsible for Fix8’s engineering activities, Raphael has drawn upon his 10+ years in software development as well as managing key projects in wireless applications, ERP, and IT services. Raphael’s love of photography and digital imagery fit right in with the Fix8 mission. Not much is known about Raphael’s past, in fact we can’t exactly put our finger on his start date either. One day he just suddenly appeared, fully formed and working (in all honesty) harder than the rest of us, so we let him stay. We still don’t know how he has the time to do what he does and still read all those issues of “Conan the Future Boy;” but some questions are best left unanswered. Hao Zhou is a senior executive with an outstanding background in digital television and the new media industry. Shortly after learning how to crawl, Hao began his career as a system engineer, and quickly his work history grew to include sales and promotions of CATV, digital TV, broadband business, indoor and lift media and wireless value-add business. You know that guy who can do anything and has somehow managed to have successfully had every job available in the time it took you to pour your morning coffee? Yeah, well, Hao’s that guy. Hao’s ambition is what has brought him to the Fix8 team with one simple mission: Make Fix8 the next star shining over greater China. If anyone can do it, it’s certainly Hao. He’s our very own Hercules. The Vickers Financial Group is the venture capital arm of the Vickers Capital Group, an Asian investment house investing in alternative assets. Vickers Venture Partners is a leading venture capital firm focusing on early stage, high growth companies focused on Asian markets. The firm’s competency stems from the fact that its decision-makers have been part of and hence well-acquainted with the pulse of diverse domains. From what we were able to dig up it seems the space is extremely crowded. The competition include weblin.com, Meez.com, SecondLife, mypictr, gizmoz.com, miieditor, simpsonsmovie.com, gickr.com, Gravatar.com, imvu.com, Zwinky, digibody.com, Faketown, doppelme, SitePal, gaiaonline, imbee, myrl.com, Kaneva, blogoscoped.com, mojikan, frenzoo.com, clickbeurs.nl, Mr. Picassohead, whyrobbierocks.com, weeworld, and voki.com, among others.